This article is about Peter Parker's aunt, May Parker. For her grand-niece, May "Mayday" Parker, see Spider-Girl. Aunt May is a fictional character appearing in American comic books published by Marvel Comics. Created by writer Stan Lee and artist Steve Ditko, the character made her first appearance in Amazing Fantasy #15 (August 1962). She is the aunt-by-marriage and adoptive mother of Peter Parker, who leads a secret life as Spider-Man. She is nurturing and supportive of Peter, although throughout most of Spider-Man's history, she has not known of his secret life and considers Spider-Man frightening. After years as a widow, Aunt May married John Jonah Jameson, Sr. (father of long-time Spider-Man critic J. Jonah Jameson). She has appeared in most other media adaptations of the comics, often playing a prominent role. May Parker (née Reilly) was born in Brooklyn, New York on May 5. After the death of her brother-in-law and his wife, May and her husband Ben Parker took in their only son, Peter, and raised him at their home in the Forest Hills section of Queens. She remained an important influence in Peter's life even during college as she was the only family he had left. Her continued belief that Peter was still the fragile boy he'd been before he gained his powers could be frustrating at times. In the early years of his superhero career, Peter feared for May's well-being and the fatal shock that he believed would result if she ever learned about his dual identity as Spider-Man. Consequently, Peter often felt anguish over dealing with major crises while his aunt needed nearly constant care. This conflict took on an unusual turn when Aunt May became sweethearts with his enemy, Otto Octavius (also known as Doctor Octopus), and Peter struggled to deal with his enemy's schemes while not hurting his aunt. During a period of convalescence at a nursing home, May met the wheelchair-bound Nathan Lubensky. Gradually, May and Nathan fell in love with each other. She invited Nathan into her Forest Hills home after converting it into a boarding house, and the couple was briefly engaged. However, May's heart was broken when Nathan suffered a fatal heart attack while protecting her from being taken hostage by Adrian Toomes, the costumed villain known as the Vulture. Some time thereafter, a guilt-stricken Toomes confronted May, begging her to forgive him for his role in Nathan's death. (Ironically, Nathan had befriended Toomes when the two briefly resided at the same nursing home). May refused to do so, stating that only God could provide the villain with the redemption he was seeking. As part of a plan by Peter's arch-foe Norman Osborn, May was replaced by a "genetically-altered actress" who impersonated her while May was held captive by villains until the actress died, Osborn returning May to Peter with a device planted inside her that would detonate a series of gene bombs if removed, decimating Earth. Fortunately, Mister Fantastic was able to disable the device without removing it, saving the world and May, who apparently retained no memory of her time in captivity. May finally learned about her nephew's secret life when she walked into his room after he had sustained a serious beating from the villain Morlun, the two later talking about May's discovery as May came to accept her nephew's real life. When Spider-Man joins the Avengers, Peter, Aunt May, and Mary Jane Watson move into Stark Tower. During the Superhero Civil War, she and Mary Jane convince Peter to unmask himself in front of a press conference. Later, she is targeted by the Chameleon, but outwits the villain by feeding him Ambien-filled oatmeal-raisin cookies. When Peter changes his mind about the Superhuman Registration Act, he moves his family from Stark Tower to a motel. An assassin hired by the Kingpin tries to kill Peter, but hits May instead. Peter takes May to a hospital where she lapses into a coma and is likely to die. However, Aunt May receives a radioactive blood transfusion from Peter, which he hoped would save her life due to his mutated healing factor. The demon Mephisto offers to restore Aunt May's health in exchange for erasing Peter's marriage from history, and Peter and Mary Jane agree. May lives, and Spider-Man's identity is once again a secret. At the beginning of Brand New Day, May is doing volunteer work for a homeless shelter, run by Martin Li, the supervillain crime boss Mister Negative. At this point, her knowledge of Peter being Spider-Man was erased. During her work at the shelter, she met John Jonah Jameson (the father of J. Jonah Jameson) and started a relationship with him. The following issue, Peter caught the two of them in bed. However, he approved of this relationship, mainly because John supports Spider-Man, who had previously saved his life, and saw through Norman Osborn as a thug who holds nothing but contempt for the people. John walked with May in Central Park and asked her to marry him, and May accepted. Despite Doctor Octopus' subconscious efforts to halt his former fiancé's wedding plans, May and John were wedded by New York Mayor J. Jonah Jameson. After the wedding, May and John embarked on a round-the-world honeymoon. It was later revealed that Aunt May has several blood relatives that are still alive. Aunt May has a sister named Jan. May's first cousins Sam and Julia are the children of her uncle Bill and his wife Claudia. Peter was attracted to Julia's daughter Alexa. The Reilly family is currently staying in Aunt May's house. Upon her return from her honeymoon, she stops by the FEAST offices, only to accidentally walk in on Martin Li, along with Hammerhead torturing one of Mr. Negative's Inner Demons. Trying to escape, Li touches her with his corrupting touch. She then returns to meet her husband and Peter. When John suggests going somewhere nice for dinner, Aunt May sarcastically proceeds to insult Peter over his fluctuating jobs and his dependence on them, culminating with calling her nephew "One damn big disappointment". A heartbroken Peter runs off. Peter returns, after a physically and mentally exhausting battle against the Lizard, tries talking to Aunt May, looking for someone to help give him hope after seeing the death of Curt Connors' humanity. She still continues to act like a bad-tempered teenager and at first, rebuffs him. However, after seeing Peter clearly suffering mentally, she feels guilty and undergoes an intense mind battle, breaking the corruption, and is shown simply sitting next to Peter. Prior to the events of Spider-Island, after Martin Li's secret identity is exposed to the public, May and John formally announce their intention to leave New York for good, for their own safety, and move to Boston. John explains this was the result of all the recent major incidents towards them and their friends and family. They put May's old house up for sale and leave once the moving van is packed. After spending their last night in New York at John's apartment, the following day she and John head to an airport in New Jersey with Peter and Carlie and they say their goodbyes before flying off. Following the Ends of the Earth storyline, when May and John are returning home to New York on their private jet, but the irresponsible superhero Alpha uses his powers without care in his battle with Terminus causes many aircraft to shut down. The Avengers rescue everybody and Spider-Man saves his Aunt May and John from Jameson's malfunctioning private jet just before it crashes. Later Peter arrives at the hospital to see that his Aunt May and John are okay, although she has sustained minor nerve damage to her leg that will require the use of a cane for the rest of her life. In The Superior Spider-Man storyline, Aunt May's leg is fully healed from operation and completion surgery with gratitude of Doctor Wirtham. As part of the All-New, All-Different Marvel, Aunt May and Jay became part of the Parker Industries's foundation, a charity focused on providing help for the less fortunate and raise the quality of life wherever it could be possible. However, her husband Jay had coughed up blood and collapsed. Aunt May is heartbroken after her husband Jay had later died in the hospital. Aunt May, Peter and J. Jonah Jameson held a moment of silence. In this alternate reality, May suffered the loss of Ben only months into their marriage. Ben was killed during the assassination of Doctor Erskine, the man who would have created Captain America. Richard and his wife promised to be there for May, but she eventually ended up raising Peter by herself. Without the influence of Ben, Peter became a troublemaker, even going so far as to steal cars, and was eventually exposed to a gamma bomb that transformed him into this reality's version of the Hulk (Bruce Banner becomes this world's Spider-Man during experiments on the animals that were affected by the bomb). May Parker was transformed by Galactus into the cosmically-powered being Golden Oldie to serve as his herald. Rather than lead him to populated worlds, Oldie discovered an extraterrestrial baker who bakes planet-sized snack cakes that sate Galactus's hunger. May's transformation is ultimately revealed as a dream. The issue, a parody of an old Hostess snack cake advertising campaign, was part of Marvel's "Assistant Editors Month" series of humorous issues. May also appeared as "Golden Oldie" (this time an Iron Man parody) as well as "The Astonishing Aunt Ant" and "Auntie Freeze" in an issue of What If?. In Spider-Man Noir, May Parker was a socialist activist in charge of a Welfare Center established by the murdered Ben Parker. In the Marvel Zombies alternate universe (Earth-2149), Spider-Man was bitten and transformed into a zombie, leading him to devour first Mary Jane, and then Aunt May, despite warning her to lock herself in the bathroom because he couldn't control himself. However, Spider-Man thereafter felt remorse for his act of cannibalism, repeatedly referring to their deaths after he has feasted and was more in control of himself rather than a slave to his pre-existing hunger. Eventually, this lead him to turn against his fellow former metahuman and mutant colleagues. In the alternate timeline known as MC2, May Parker's death in The Amazing Spider-Man #400 was valid. It was May who died in this continuum, rather than an actress. Peter's daughter, May "Mayday" Parker, was named for her. Mayday became the super-heroine Spider-Girl and met the original May when she found herself displaced in time, although Mayday makes no attempt to explain who she really was. When Spider-Girl was trapped in an illusion by her enemy, Misery, she was given encouragement from a familiar spirit. She recognised the spirit as being Aunt May. In the final arc of Amazing Spider-Girl, Aunt May acts a spiritual advisor to May in order to help her grandniece reclaim her identity and save Peter from Norman Osborn. In this form, she initially appears as a younger version of herself, which prevents May from recognising her. However, May finally figures it out when she sees Aunt May through her father's eyes. In the retelling of the Clone Saga, May did not die as in the original storyline. Rather, she was infected with a virus by Jackal along with Mary Jane. Though she is close to death, Ben Reilly and Peter manage to get the cure and save her life. May and Ben are later by Peter and Mary Jane's side when she gives birth and is horrified when news breaks that Allison Mongrain has stolen baby May. The baby is later returned to the Parkers. An alternate Aunt May appears in a flashback along with the version's Uncle Ben. In this reality they are shown as scientists and the ones who informed Peni Parker that she was the only person able to carry on the project (after her father, the original SP//dr, died in battle), and accepted the responsibility, allowing the radioactive spider that formed the other half of SP//dr's CPU to bite her. Aunt May and Uncle Ben are with their nephew, Peter at the hospital after suffering a serious allergic bite from the spider leaving him in a coma while their house is burgled. Peter was transforms into a man-spider and proceeded to attack Aunt May and Uncle Ben only for versions Spider-Man Noir to thwart him and Six-Armed Spider-Man would later create a cure and saved Peter from this state, reflecting that, in at least one reality, the Parker family has a happy ending. On Earth-803, May is a young woman in a 19th-century steampunk-inspired New York. Her father studied animals, and one day when she let a spider out of a cage to get it comfort and to pet it, she got bit and learned that it was important not to let anyone cage her. After her father died she used spare parts to create a suit with four mechanical arms that allowed her to climb walls and web shooters. While attending a ball the mayor was kidnapped by the Six Men of Sinestry, allowing her to debut as the Lady Spider. Though the villains manage to get the mayor's plans, she defeats them and causes them to retreat. She then appears as part of the Spider-Army. The Inheritors then attacked them separating her with the rest and would accompany Spider-Man 2099 to his dimension where they fend off the Inheritor Daemos. They then traveled to the Earth-13 before going back to her own dimension to fix Leopardon. She is present at the final battle with the Inheritors in Loomworld. May Parker is the aunt of Penelope Parker on Earth-11. Penelope told May about the spider bite she received during an accident at Osborn Labs and how she developed spider-like abilities and wanted to hide her powers so people would think she was normal. However, Aunt May convinces her niece being normal was so overrated and she should embrace what happened to her as a gift and to use it to help people. On Earth-3123, Aunt May is known as Spider-Ma'am. She and her family was confronted by Karn. Sensing that he is too strong for her, she proposed to offer her life for the sake of her family leaving Karn hesitant for a moment (because she reminded him of his mother). When Karn was about to strike the killing blow, the other Spider-Men intervened to convince him to join them. In this Secret Wars Warzone, when Peter is captured by Regent and his life is flashing before his eyes, one of his memories was him standing in front of Aunt May's open casket at her funeral, confirming that she died sometime before the events of the comic. The 2003 limited series Trouble was marketed as the "true origin" of Spider-Man. In that story, teenagers named Ben, Richard, May and Mary met while on summer vacation. Ben and May are one couple while Richard and Mary another. Richard is secretly also seeing May who becomes pregnant with his child. She informs Ben of this who counters that he is sterile. May gives birth to a boy and her best friend Mary presents it to Richard as her own. None of the characters' last names were revealed. The story did not become canon because of its negative reception. In the Ultimate Marvel version of Aunt May is based on writer Brian Michael Bendis' mother. This version of the character is a strong and independent woman in her late forties or early fifties, significantly younger than her original Marvel Universe counterpart. She is the biological sister of Mary Parker, and wife to Ben Parker. After the death of Ben Parker she is the pillar strength for Peter. She is slightly overprotective of her nephew, and not supportive of Peter's secretive behavior. At one time, prior to the man's death, she had romantic feelings for John Stacy (the Ultimate Marvel version of George Stacy), the policeman who investigated Ben's murder and was the father of Gwen Stacy. May has been seen working in an office cubicle and attending a PTA meeting. Peter decides to reveal his secret to her one night, only to find a note indicating that she has left to go on a date with, Professor Miles Warren, Harry Osborn's hypnotist/therapist (on Earth-616, Warren is the Jackal). Peter reveals his secret identity to Aunt May after he finds Gwen Stacy's clone at her old house, resulting in May evicting Peter from her home, as she despises Spider-Man. This coincides with the appearance of a man who appears to be Richard Parker, Peter's father. Peter learns that May had known this man, who is revealed to be a clone of Peter who has been artificially aged, and that she kept this secret from Peter to "protect him," believing that if Richard had deliberately kept his survival secret from his own family for years, that he was not worth knowing and that the revelation that Peter had been abandoned, not orphaned, would be too much for the boy. After a long talk between Peter and his "father", Nick Fury and a team of Spider Slayers surround the Parker home, which triggers a transformation in Gwen, turning her into Carnage. May then suffers a heart attack. She is rescued from dying by Sue Storm of the Fantastic Four, reconciles with Peter and accepts his life as Spider-Man, though she is not at all fond of his costume. Peter later explains to May why he became Spider-Man, and May tells him that Ben would be proud of him for doing so. During the events of the "Ultimatum" storyline, May is taken in for questioning by the New York Police Department concerning her odd connections to several vigilantes, most notably Spider-Man. The questioning is interrupted by a tidal wave that devastates New York, and no charges or further questioning is pursued subsequent to it. After "Ultimatum" May turns her home into a teen shelter for superhumans without a home, including Bobby Drake (Iceman), Kitty Pryde (Shadowcat), and Johnny Storm (Human Torch). During the climax of "The Death of Spider-Man" storyline, Aunt May manages to shoot Electro with a gun. She is by Peter's side when he dies following a battle with the Green Goblin, who dies shortly after Peter. Although angry at the Ultimates for belittling Peter's accomplishments in life when attending her nephew's funeral, May is nevertheless comforted when she met some of the people that Peter had saved during his career as Spider-Man, one little girl even offering her a comforting hug as thanks for raising the man who saved her. After the funeral, May and Gwen decide to take up Tony Stark's offer to set themselves up for a new life in France. However, following the emergence of a new Spider-Man, May and Gwen return to New York. Though Captain America threatens to arrest Miles' parents and expose his secret to them unless he retires the Spider-Man identity, May and Gwen are more supportive of Miles, and May gives him Peter's old web-shooters, along with the formula for the web-fluid, encouraging him to carry on Peter's legacy. During the Spider-Men miniseries, May and Gwen are back in the United States, presumably to oversee the selling of the Parker Residence and to finish Gwen's term at Midtown High. They encounter someone wearing a red-and-blue Spider-Man costume and believe he is a lunatic who is disrespecting Peter's memory. They become angry and threaten to call the police. However, when the person unmasks himself, they are stunned beyond belief to see the older, more mature Peter Parker, from the Marvel 616 universe. She initially is unconvinced that this Peter is who he says he is, but both she and Gwen later realize he is being truthful when he knows Uncle Ben's admonishment about power and responsibility. May is greatly moved at realizing that she has now been given the chance for closure that she had missed when her Peter died, and concludes that she had made the right choices concerning her nephew, before the adult Peter is returned to his universe. When Green Goblin escapes custody after S.H.I.E.L.D. was shut down, he arrives at the front yard of Aunt May's house and confronts the new Spider-Man. Aunt May and Gwen are inside watching the television where the battle of the new Spider-Man and Green Goblin was being broadcast. Soon, Spider-Man emerges to aid the new Spider-Man in the fight, to the surprise of Aunt May and Gwen. Green Goblin flees at his arrival and the two Spider-Men depart. Gwen is unsure of the identity of the original Spider-Man, but Aunt May assures her that his motives show that it is him. Later, Aunt May and Gwen walk over to Mary Jane's house and overhear Peter's unknown resurrection. Aunt May sprints over and joyfully reunites with her nephew. After the two Spider-Men defeat Green Goblin, Peter tells Aunt May that he intends to go on a quest to find out the truth of his mystery resurrection. May's first appearance in animation was in the first season of the 1960s Spider-Man series as part of the episode "Horn of the Rhino", voiced by Peg Dixon. In the episode, she is seen trying to nurse Peter over a severe headcold and very abruptly telling J. Jonah Jameson that he was not to call Peter about photo assignments until he had recovered. May apparently made an impression on Jameson as he told Betty Brant that he did not ever want to speak to May again. May had also made two tiny appearances in the first two episodes of the second season of the 1960s Spider-Man series. In the second season premiere where it revealed about Spider-Man's origin, she and Uncle Ben made a tiny cameo about what Peter was doing after no one knew he was bitten by a radioactive spider. In "King Pinned," she was taking medications to cure a sickness she had only it was making her feel worse. It was then revealed that it was a drug created by the Kingpin that would be fake medicine for the elderly to take that would make them feel worse to the point of death, but the plan was foiled by Spider-Man and Aunt May was saved, along with every other elderly person who took the drug. In the 1977 television film for the CBS series The Amazing Spider-Man, Aunt May is portrayed by actress Jeff Donnell. The character subsequently appears in one episode of the series, "Night of the Clones," where she is portrayed by Irene Tedrow. 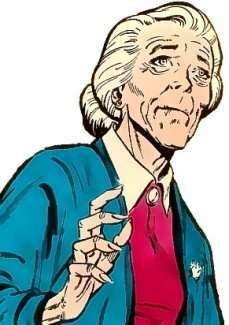 Aunt May appeared in the 1980s Spider-Man TV series voiced by Linda Gary. Aunt May appeared several times in the course of Spider-Man and His Amazing Friends voiced by June Foray. The Spider-Friends secretly operated in her house. Aunt May notably appeared in the 1990s Spider-Man: The Animated Series with Linda Gary reprising Aunt May for the first three seasons and later voiced by Julie Bennett in the last two seasons following Gary's death. In this version, her character strongly disliked Spider-Man but loved his alter ego, her nephew Peter Parker. Due to her age, she had health problems throughout the series; this annoyed younger viewers, as it took time away from Spidey fighting crime. She had many encounters with villains Spider-Man fought like Venom (as Eddie Brock), the Hobgoblin, Doctor Octopus, Morbius, the Chameleon (who was imitating Anna Watson), Tombstone, Green Goblin, the Scorpion and the Shocker. She has a past with Keane Marlow as friends. Keane was also friends with May's late husband Ben (and unbeknownst to her, he was also a member in the 1940s superhero team called the Six Forgotten Warriors as the Destroyer). May was friends with Anna Watson, and despite their friendship and May's kindness towards Mary Jane, Anna had no respect for Peter and he had to tolerate her (though there was a time when Peter blurted out to her in anger where she blamed him for Mary Jane getting kidnapped by the clone of the dead Hydro-Man) and Anna even once expressed respect for him when he was with Mary Jane after she was saved from the Hydro-Man clone. May even gave Peter and Mary Jane her and Ben's wedding rings when Peter and M.J. were getting married. By the series finale of the show, it was revealed that when the Beyonder and Madame Web rounded up Spider-Men from different realities, in the Scarlet Spider and Spider-Carnage's reality, Aunt May was dead along with Uncle Ben, but her cause of death was unknown. Aunt May Parker appeared in The Spectacular Spider-Man voiced by Deborah Strang. In "Persona", she began to feel faint while cooking dinner, but shook if off the moment Peter arrives. In "Group Therapy", she suffered a heart attack while out to a Broadway show with her friend Anna Watson during the Sinister Six's attack. Peter, who was under the influence of the symbiote suit, was unaware of it until Mary Jane Watson visited to tell him May was in the hospital. She recovered and headed back home for a Thanksgiving dinner with Peter, her doctor, Gwen and Captain George Stacy at the end of the first season, where May informed the others that she was writing a cookbook and had already received an advance from a publisher. In Season 2 she is revealed to be feeling much better after the heart attack though Peter still worries about her. Her and her doctor, Doctor Bromwell, have also seem to have a liking over each other. The doctor described her as his favorite heart patient and even checking her up at her own home. She does not know that her nephew is Spider-Man and when asked by the reporter Ned Leeds if he is Spider-Man she thought she was being punked. After Peter's feelings were mixed in between Liz Allan and Gwen Stacy she gave Peter advice that he needed to be honest between both of the girls but before that he must be honest with himself. Aunt May appears in Ultimate Spider-Man voiced by Misty Lee. This version of the character is less fragile than her traditional depictions and is shown to be involved in various hobbies such as yoga and cooking classes, which allow Peter to sneak out of the house without arousing suspicion. In "Attack of the Beetle", she was asked out to dinner by S.H.I.E.L.D. Agent Phil Coulson (who Nick Fury assigned to be the acting principal of Peter's school). Near the end of the Season 3 finale four-parter, she reveals she had known for sometime that Peter was Spider-Man, and says she's okay with it and that it changed nothing between them. An alternate version exists in Kid Arachnid/Spider-Gwen's reality, in which she assists Gwen Stacy operate as Spider-Woman after the disappearance of Miles Morales and the death of her Peter Parker. Aunt May is referenced by Spider-Man in the The Avengers: Earth's Mightiest Heroes episode "New Avengers". Aunt May is mentioned in the crossover episode Phineas and Ferb: Mission Marvel where Spider-Man uses the line "Aunt May, Phineas and Ferb are doing a crossover" in the title sequence. In Sam Raimi's Spider-Man films, Aunt May was played by Rosemary Harris as a housewife who is widowed by the events of the first film. She was the one who encouraged Peter the most throughout the films with her words of wisdom as Uncle Ben had done before his death, in the second movie even managing to make him try to return to his Spider-Man life after losing his powers. In the 2002 film Spider-Man, Aunt May and Uncle Ben take care of their nephew, Peter Parker. After Uncle Ben (Cliff Robertson) is shot and killed by a carjacker, Peter and May share their grief for Uncle Ben. Later, when Peter moves into an apartment with his friend Harry Osborn, Aunt May visits them on Thanksgiving. She is not shy about reprimanding Harry's father Norman for his rude and boorish behavior. Shortly thereafter, when Norman (who has become the villainous Green Goblin), learns Spider-Man's identity, he attacks May at home while she is saying her prayers. May is terrified by the Goblin's demonic appearance, and is hospitalized after the Goblin injures her. May shows up at Norman Osborn's funeral alongside Peter, Mary Jane and Harry; soon after that, she and Peter visit Ben's grave located elsewhere in the cemetery. In the sequel, Spider-Man 2 (2004), Aunt May continues to look after Peter, and has had financial difficulties since the death of her husband, forcing her to sell the house and live in a smaller apartment (although it is implied that the bank is cheating her out of the house). Her opinion of Spider-Man is not high, claiming "the less we see of him, the better." However, when May's visit to the bank with Peter is interrupted by a robbery perpetrated by Otto Octavius, Octavius takes her hostage and climbs the side of a skyscraper with her. She is in turn, rescued by Spider-Man (and in return, helps Spider-Man during the battle by bashing Octavius in the head with her umbrella), and from that point believes that he was good; it is implied, but never stated, that she may have deduced his secret identity. Later in the film, Peter's powers began to wane because of a subconscious desire to live a normal life, and he decides to give up his costumed persona; May makes a speech which encourages him to resume his heroic activities. She later expresses that she feels she caused Uncle Ben's death ("You wanted to take the subway, and he wanted to drive you. And if I had stopped him, we'd all be having tea together. "), prompting Peter to admit that he caused the death by not stopping the killer. May is understandably stunned and sad, but later thanks Peter and tells him that admitting the truth to her was a brave thing to do. When talking to Doctor Octavius, Peter helps him regain his sanity by repeating what May had told him about giving up your dreams sometimes to do what's right. In Spider-Man 3 (2007), Peter tells Aunt May that he is going to ask Mary Jane to marry him, after which the two embrace. May then tells him that he needs to come up with a good way to initiate the proposal, and that he needs to put his wife before him, no matter what. She then relates to Peter how Uncle Ben proposed to her, and that they would have been married for fifty years "this August", had Ben not been killed. She then takes off her engagement ring and asks Peter to use it to propose to M.J. May is also present alongside Peter when Captain Stacy tells them that Flint Marko, his uncle's "actual" killer, is on the run. She plays a strong role in providing moral support to Peter, but nothing much is really done by her in the third movie, nor is she ever targeted by Spider-Man's foes as in the previous two movies. Later, when Peter informs May about Sandman's apparent demise at the hands of Spider-Man (under the influence of an alien symbiote), she delivers another speech, which is more of a warning to Peter of the danger to oneself in seeking revenge. Peter is at first shocked at his aunt's reaction, for he expected Aunt May to be happy as Sandman was the one who killed Uncle Ben. Peter soon realizes that this is not the case, and Aunt May says that Uncle Ben would never have wanted revenge. Much later, May talks to Peter in his apartment where Peter says that he has done terrible things (after separating from the symbiote suit that had caused him to hurt Mary Jane and Harry). He tries to return her ring to her, but Aunt May says that she knows that he will find a way to put it right, and gives it back. Like May, Peter comes to forgive Sandman who admits he killed Ben by accident while trying to get money to save his daughter's life. May later appears at the end of the film attending Harry Osborn's funeral. Aunt May was portrayed by Sally Field in the 2012 reboot The Amazing Spider-Man, and is shown somewhat younger and more strict than in previous depictions. Throughout the film, she expresses concern for Peter being out late and coming home injured, though he refuses to admit to her where he has been. At the end of the film, despite coming home in serious pain, Peter brings home the eggs she asked him to get in the middle of the film and does not bother to ask what happened. Field reprises her role as Aunt May in The Amazing Spider-Man 2. She has become a nursing student to support herself and Peter financially after Peter graduates from high school. She reveals to Peter that she and Ben were visited by government agents a few days after Richard and Mary disappeared and were told that Richard was planning to sell secret weapons to foreign powers. She later comforts Peter during his depression over Gwen Stacy's death and contributes to giving him the confidence he needs to become Spider-Man again, heavily hinting that she knows Peter's secret. Marisa Tomei portrays Aunt May in the Marvel Cinematic Universe, first appearing in 2016's Captain America: Civil War. She is set to reprise her role in the 2017 film Spider-Man: Homecoming. In Captain America: Civil War, May appears at her and Peter's apartment and is visited by Tony Stark, who is attracted to her. In the post credits scene, she is seen tending to Peter's injuries, and appears unaware of Peter's super heroic activities. Aunt May makes a cameo appearance in Marvel Super Heroes vs. Street Fighter. Aunt May was featured in the Spider-Man 2 video game voiced by Mindy Sterling. Aunt May was mentioned in the Ultimate Spider-Man video game. Aunt May appears in Lego Marvel Super Heroes voiced by Kari Wahlgren. Aunt May appears in The Amazing Spider-Man 2 voiced by Diane Michelle. Aunt May, as Spider-Ma'am is playable in the mobile game Spider-Man Unlimited. ↑ The 2007 Free Comic Book Day edition of The Amazing Spider-Man. ↑ Sanderson, Peter (2007). The Marvel Comics Guide to New York City. New York City: Pocket Books. pp. 49–51. ISBN 1-4165-3141-6. ↑ Colton, David (July 7, 2009). "Comic fans fume as Marvel erases Spidey-MJ marriage". USA Today. Retrieved April 25, 2010. ↑ Richards, Dave (September 30, 2011). "COMMENTARY TRACK: Bendis on "Ultimate Comics Spider-Man" #2". Comic Book Resources. ↑ Bendis, Brian Michael (w); Bagley, Mark (p). Ultimate Spider-Man #45. Marvel Comics. ↑ Bendis, Brian Michael (w), Bagley, Mark (p). Ultimate Spider-Man #160, Marvel Comics. ↑ Bendis, Brian Michael (w), Pichelli, Sara (p). Spider-Men #4 Marvel Comics. ↑ "'Captain America: Civil War' premiere: 5 things we learned". USA TODAY. Retrieved 2016-04-13. ↑ Kroll, Justin (March 7, 2016). "Zendaya Joins 'Spider-Man' Reboot". Variety. Archived from the original on March 7, 2017. Retrieved March 7, 2016. ↑ Arrant, Chris (October 12, 2013). "NYCC 2013: Marvel Adds More Characters To LEGO MARVEL SUPER HEROES Game". Newsarama.